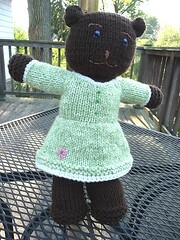 Here's my latest bear, Harriet. She is bear #8 and yes her head looks bit. I think that's because she isn't wearing a scaf. I’ve inside out double knit several of them now. I do not use the slip stitch method rather knit both sides at once. I use two strands of yarn and cast on using an alternating long tail cast on so I cast on with both strands at once. The only thing you have to remember is to twist the two yarns over each other before beginning the next row otherwise you’ll have a whole. When I’m working the tube for the garter stitch inside out and I want my first row on the inside to be a purl I’ll knit my first stitch with both yarns in back then purl the next stitch with both yarns in front so when I see it from the outside I’m looking at my first row as being purl on both sides, but the inside (which is what you’ll see when you flip it right side out will begin with purls). The real trick when knitting the method just described is to keep to work the correct yarn because if you accidentally purl a front stitch with the yarn you’ve been using to knit the back sts the tube will not open and you’ll be plagued with a necessary frog; this is why I constantly pull the tube apart while on the needles to insure that if I did accidentally mix the yarns up I won’t have to rip back too far to correct the problem. Ok, now how to knit both sides inside out so that purl sts are facing out and knit sts are facing in… Simple as pie and actually so much easier than the regular double knitting with knit side out. After crossing your strands to avoid holes, you begin with a purl stitch using the yarn that you worked your last stitch with before turning but you will this time keep your knitting strand at the back of your work. So basically you have one strand on each side of the needle (one front, one back). I like to use my knuckle to straddle the yarns between front and back. Then you purl with the yarn in front then knit with the yarn in back and repeat but never ever move your yarns from that position! The front stays in front and works all the purls and the back stays in the back and only does knit sts! It’s almost brilliant! When working from the legs up after you’ve gotten the desired length of the first leg you’ll cut both yarns leaving enough to close the crotch and hold the left leg either on the needles or on waste yarn (your preference).Then cast on and work the second leg. Once the second leg is the same length as the first you will join the two legs by putting the first leg back on the needles if necessary and work the next row right across the second leg into the first leg. When you come to the arm holes you will need to switch to working the chest across rather in than in the round/dk; I suppose its a matter of choice if you flip it at this point and knit or leave it inside out and purl. Rejoin after the 8 rows for the arms and work the head. I flip my work, and work the chest between the arms then flip it inside out again and finish up the head using inside out DK. The arms can be worked anyway you prefer I suppose. I usually just dpn the arms since there’s not that much to do.